People help an unidentified injured person after gunmen attacked a cafe popular with foreigners in Bangladesh’s capital, Dhaka, on Friday. 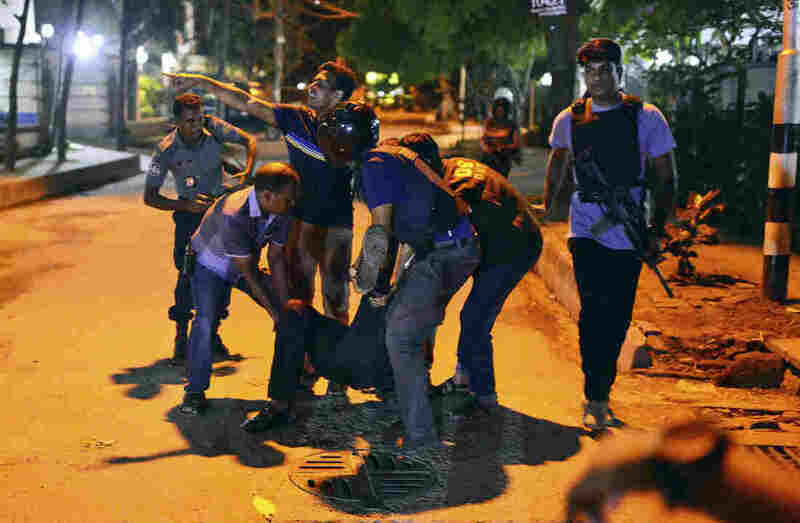 A group of gunmen attacked a cafe and have taken hostages in Bangladesh’s capital, Dhaka, according to local media reports. It’s not clear whether there are any casualties or how many attackers might be involved. The U.S State Department and local media say the cafe is in an upscale neighborhood called Gulshan that is home to many foreign embassies. According to the Dhaka Tribune, the director general of the Rapid Action Brigade, Benazir Ahmed, said there was shooting at the Holey Artisan Bakery cafe and that a hostage situation was unfolding elsewhere in the same building, at the O’kitchen restaurant. However, the U.S. Embassy in Dhaka said the hostage situation was happening at the Holey bakery. The embassy tweeted that people should shelter in place. State Department spokesman John Kirby told reporters the situation is “very fluid, very live,” but that “all American citizens working under the Chief of Mission Authority” have been accounted for. Kirby said the department is still working to account for staffers of other nationalities. It’s not clear what motivated the attack. But Bangladesh has recently seen a string of armed attacks against prominent atheists, secularists and members of the LGBT community.